One of those episode-to-episode references occurred in an episode entitled "In Search of an Artist," which aired on Thursday, January 2, 1969, and guest-starred Broderick Crawford, when former San Francisco Chief of Detectives turned special consultant to Commission Dennis Randell, Robert T. Ironside, was approached by a knife-wielding thug in a Catholic church in Mexico while looking for an artist-friend who had been presumed dead after being framed for a murder that he did not commit. As the thug, played by the very capable character actor Myron Healey, held the knife to Ironside's back, Raymond Burr's second famous television character said to aide-de-camp Mark Sanger, played by Don Mitchell, who turned seventy years of age on March 17, 2013, "What was that you said about my havin' eyes in the back of my head?" This was a reference to the fourth episode of the first season, "Eat, Drink, and Be Buried," which aired on Thursday, October 5, 1967, and guest-starred Lee Grant and Quincy Jones, the composer of the series' theme music. That episode ended as Ironside, his head turned away from a game of pool, reacted as Office Eve Whitfield, played by Barbara Anderson, who turns sixty-eight years of age on November 27, 2013, the Feast of Our Lady of the Miraculous Medal, made a seemingly impossible shot. Mark Sanger, who rose from juvenile delinquent to lawyer/police officer and then, by the time of the reunion movie, a judge, saw that Ironside had not seen the play but had known what happened nevertheless. "Eyes in the back of his head. It's ridiculous," hence the reference in the episode that aired fifteen months later. Well, longtime readers of this site might, emphasis on might, remember a three-part series that ran in September 15 and 16, 2010, prior to the now-retired Joseph Ratzinger/Benedict XVI's visit to the United Kingdom., that was entitled Calling Cesar Romero, Calling Cesar Romero, part one and Calling Cesar Romero, Calling Cesar Romero, part two. Cesar Romero, readers of my generation or older may recall, was, apart from being a distinguished actor who had played "The Cisco Kid" in six motion pictures from 1939 to 1941 prior to Duncan Renaldo's purchasing the rights to O. Henry's (real name: William Sydney Porter) "Robin Hood of the West" and becoming forever identified as the definitive Cisco Kid, "The Joker" in twenty-two episodes and one motion picture of the Batman television series starring Adam West and Burt Ward. 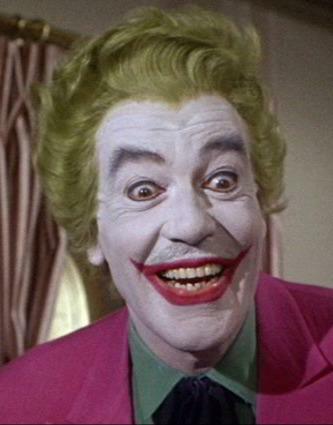 Here is a reminder of what Cesar Romero looked like after the makeup department at Twentieth Century Fox studios got through turning him into "The Joker:" Joker:"
Hence it is, ladies and gentleman, evoking the line used by Raymond Burr's character in "In Search of An Artist" 16, 381 days ago now (yes, I had to look this up; the information about Ironside, however, is among the many useless pieces of trivia from my days as a television-watcher), "What was that I was saying about Cesar Romero back in 2010?" Well, the Vatican's "Joker" is actually no joker at all. His mockery of the dignity with which a true and legitimate Successor of Saint Peter should carry himself is only symbolic of his daily mockery of everything to do with Catholic Faith, Worship and Morals. Jorge Mario Bergoglio and his counterfeit church of conciliarism have made a total mockery of our Holy Faith, a mockery that has scandalized Catholics and non-Catholics alike, driving millions of Catholics into the waiting arms of the devil's minions in scads upon scads of fundamentalist or evangelical Protestant sects or into becoming rank infidels. To be sure, of course, the Vatican's Jorge the Joker is attracting "disaffected" Catholics and non-Catholics who reject Catholic doctrinal and moral teaching because he misrepresents the Gospel of the Divine Redeemer, Our Blessed Lord and Saviour Jesus Christ, to teach that Our Lord seeks out the lost sheep without any desire to see them reform their lives, that He accepts them "just as they are" so that they be "welcomed" into the "feast" as we, the "Pharisees," seek to "understand" them and their "needs" and their "pain." No, this is no exaggeration. This is a completely faithful summary of what he has said in just the past two days. (Vatican Radio) Finding the lost sheep is a joy to God, because he has a “loving weakness” for those who are lost. These were the words of Pope Francis during his homily at Mass on Thursday morning in Casa Santa Marta. Commenting on the parables of the lost sheep and of the lost coin, Pope Francis talked about the attitude of the scribes and the Pharisees, who were scandalised by the things that Jesus did. They murmured against him: “This man is dangerous, he eats with the publicans and the sinners, he offends God, he desecrates the ministry of the prophet to accost these people”. Jesus, the Pope explained, says that this “is the music of hypocrisy”, and “answers this hypocrisy with a parable”. The work of God, the Pope continued, is to “go and search”, in order to “invite everyone to the celebrations, good and bad”. Then, Pope Francis explained, “when he has found the sheep” and brought it back into the fold with the others, no one must say ‘you are lost’, but everyone should say ‘you are one of us’, because this returns dignity to the lost sheep. “There is no difference”, because God “returns to the fold everyone he finds. And when he does this, he is a God who rejoices”. Our Blessed Lord and Saviour Jesus Christ seeks out the lost sheep in order to convert them, to accept them and then invite them to a "party" to "celebrate" their having been "found" even though they remain in a state of Mortal Sin without any intention of reforming their lives. And he said: A certain man had two sons:  And the younger of them said to his father: Father, give me the portion of substance that falleth to me. And he divided unto them his substance. And not many days after, the younger son, gathering all together, went abroad into a far country: and there wasted his substance, living riotously. And after he had spent all, there came a mighty famine in that country; and he began to be in want. And he went and cleaved to one of the citizens of that country. And he sent him into his farm to feed swine. And he would fain have filled his belly with the husks the swine did eat; and no man gave unto him. And returning to himself, he said: How many hired servants in my father' s house abound with bread, and I here perish with hunger? I will arise, and will go to my father, and say to him: Father, I have sinned against heaven, and before thee:  I am not worthy to be called thy son: make me as one of thy hired servants. And rising up he came to his father. And when he was yet a great way off, his father saw him, and was moved with compassion, and running to him fell upon his neck, and kissed him. And he called one of the servants, and asked what these things meant. And he said to him: Thy brother is come, and thy father hath killed the fatted calf, because he hath received him safe. And he was angry, and would not go in. His father therefore coming out began to entreat him. And he answering, said to his father: Behold, for so many years do I serve thee, and I have never transgressed thy commandment, and yet thou hast never given me a kid to make merry with my friends:  But as soon as this thy son is come, who hath devoured his substance with harlots, thou hast killed for him the fatted calf. The son who was dead had come back to live because he had repented of his sins, which is what happens to a spiritual dead soul in the Sacred Tribunal of Penance after a good, integral and sincere confession of his sins and a firm purpose of amending his life. Jorge "The Joker" Bergoglio never mentions the very point of repentance that Our Lord had made when relating the Parable of the Prodigal Son as he believes that everyone, without respect to his desire to amend his life, is welcomed at the "feast." Well, this may be the case insofar as the "feast" he desires to celebrate, which is why he is being so acclaimed by the forces of the world, the flesh and the devil. It is not, however, what Our Lord desires as His eternal feast in Heaven is open only to those who die in a state of Sanctifying Grace as a member of His Catholic Church. Who are those wo do not want to "participate" in the "feast"? Those who do not engage in the "full, active and conscious" manner while they enjoy the "feast" that is the Novus Ordo liturgical service, whose very false spirit is evocative of worldliness and anthropocentrism (man-centeredness) and "community fellowship" while those who participate fully, active and consciously are "reaffirmed" by the presider in their essential goodness, that God loves them "just the way they are." On the practical level, Jorge "The Joker" Bergoglio's belief that to "enter into the Church is to participate in all the virtues, the qualities that the Lord has given us in our service of one for the other" is all about whether Catholics care for the "poor" and into their lives with joy to alleviate their temporal needs and physical suffering. Jorge Mario Bergoglio mentioned nothing about becoming holy, of avoiding the near occasions of sin (going anywhere near him and his false church is indeed an occasion of sin! ), of obeying the binding precepts of the Divine Positive Law and the Natural Law. No, his is the "gospel" of "liberation theology," which seeks not to judge unrepentant sinners or to condemn the grave harm their sins do to themselves and the world-at-large, but which is full of condemnation for those who seek the conversion of such sinners and who take seriously the quest for personal sanctity despite their own sins and failings. The "world" is enjoying Jorge "The Joker" Bergoglio's "feast" as worldlings celebrate with gusto his reaffirmation of their essential goodness. The false "pontiff" has gone to great lengths to say that the only thing that really matters to God is "service to the poor," and this has done much to assuage those who are steeped in what are Mortal Sins in the objective order of things, including the four sins that cry out to Heaven for vengeance, that God loves them for their service to the poor and their support of statist programs designed ostensibly to "help" but them but wind up enslaving us all to the dictates of those intent on making everyone in the world equally poor and equally obedient to their immoral, unjust decrees. This is not a matter of academic speculation. Not at all. 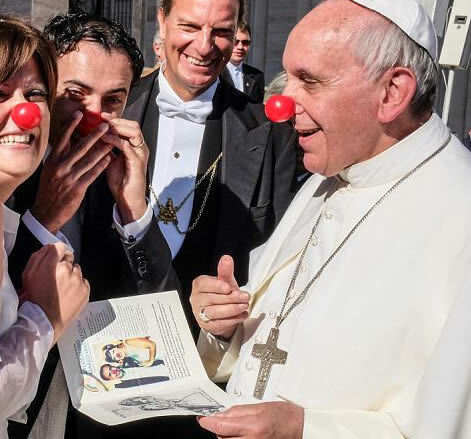 This is empirical proof now that Jorge "The Joker" Bergoglio's five little words, "Who am I to judge? ", uttered to reporters on his return from from Brazil on Monday, July 29, 2013, the Feast of Saint Martha (see Francis Says ¡Viva la Revolución!, part three) and his concern about Catholics being "obsessed" with issues such as abortion an "gay marriage," made in his interview with "Father" Antonio Spadoro, S.J. (see Francis: Apostle of Antichrist, part two) that appeared in America magazine two months ago now. Indeed, the following passage from the Spadoro interview has helped to embolden pro-abortion, pro-perversity politicians, Catholics and non-Catholics alike, into acting with alacrity to support one immoral piece of legislation after another, including "gay marriage:"
Those Catholic legislators in Illinois who had been "undecided" prior to Jorge "The Joker" Bergoglio's were, in all likelihood, undecided because they knew what was morally correct but feared offending those whose lives were steeped in unrepentant sins of perverted vice against the Sixth and Ninth Commandments. Bergoglio gave them a perfect cover to justify their actions even though his defenders surely will say that his words were taken out of context. No, they not. Words have meaning, and Jorge "The Joker" Bergoglio has bigger "fish to fry" that "obsessing" over moral issues. He has not once, at least not so far, uttered a word after France "legalized" "gay marriage" and after Brazil "legalized" a "back door" to the surgical killing of babies only days after he had been in the country for World Youth Day and after he had received Brazilian President Dilma Rousseff, a Catholic, so lovingly without uttering a word to her publicly about the pending legislation there. Jorge "The Joker" Bergoglio may be enjoying the feast that has made him "the toast of the town." Unfortunately for him, however, this "feast" may be the only one he gets as those who make a mockery of the Catholic Faith in life without repenting of their crimes before they die will not enjoy the true and only eternal feast in Heaven made possible for us by the shedding of every single drop of Our Blessed Lord and Saviour Jesus Christ's Most Precious Blood during his Passion and fearful Death on the wood of the Holy Cross. This is the month of the Holy Souls in Purgatory, they who need to be purified of the debt owed to God because of their forgiven Mortal Sins and their unforgiven Venial Sins and their general attachment to sins and of their disordered self-love that kept them from living God perfectly in this passing, mortal vale of tears. Although they cannot help themselves, which is why we must have Masses offered and to pray Our Lady's Most Holy Rosary for them, they can assist us by means of their prayers. We need to pray for the Poor Souls so that we can be completely unspotted by the errors of the day, including the mocking of the Holy Faith that passes for Catholicism that is being trumpeted so boldly by Jorge Mario Bergoglio and friends, as we seek to make reparation for our own sins and those of the whole world, including the conciliar revolutionaries, as the consecrated slaves of Our Blessed Lord and Saviour Jesus Christ through the Sorrowful and Immaculate Heart of Mary. It is a good idea to pray a Rosary now in reparation for Bergoglio's apostasies and that many Catholics will use this moment to recognize that Our Blessed Lord and Saviour Jesus Christ desires to rain down graces upon them through the Sorrowful and Immaculate Heart of His Most Blessed Mother in order to reject conciliarism and its false officials and false doctrines and sacrilegious liturgies once and for all. The Four Holy Crowned Martyrs, pray for us.